Written by William Robinson 1939 - 1941, then aged about 20. Carting muck. Took last of fat lambs to Auction 35/- and 24/6. Started topping S.H. hedge again O.S. At Over Bleaze. S Daisy 25th calved white C.C. Foggy thawing very bad traveling. Sorting sticks. 2 carts of lime and mould into Square S and 1 cart of pea sticks home. 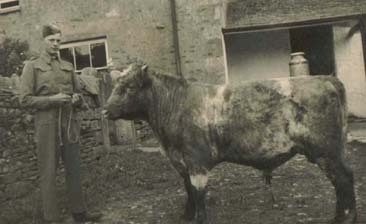 Full control of livestock introduced by Government. Bought pair of shoes16/6 from C.W.S. Lorry of straw came. Rosette 12th calved B.C. Brought sheep off lots 28. Not much snow if level but all drifted into big drifts never seen anything like it. Jobbing about. 1 cart water. Maggie 14th calved B.C.